This beautiful triple-layer invitation features a great interplay of typestyles and ink colors matched to the papers used. 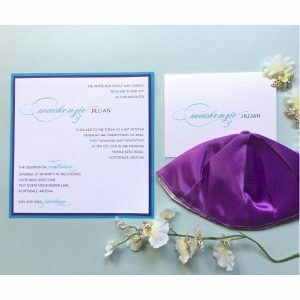 Your wording details will appear on Avon White Linen card stock framed by bottom layers of Colorplan Purple and Blue Hue. This beautiful triple-layer invitation features a great interplay of typestyles and ink colors matched to the papers used. Your wording details will appear on Avon White Linen card stock framed by bottom layers of Colorplan Purple and Blue Hue. Measures 7-1/4″ square. Shown with Blue Hue and Violet inks with lettering styles Neutra Text Caps (body) and Burgues Script (name and select lines.) 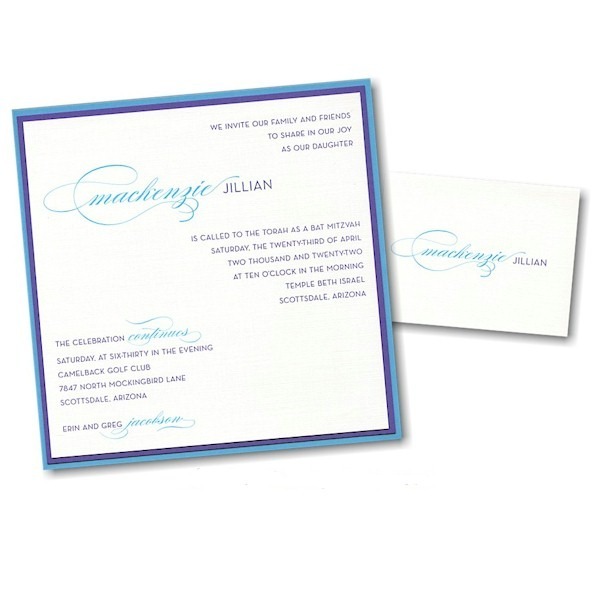 The coordinating Reception and Response enclosures will print on single Avon White Linen stock and the Thank You notes will print on matching folder stock. This Bat Mitzvah invitation is accompanied by single Avon White Linen envelopes. Additional postage is required due to the square shape of this invitation. Please consult your local Post Office for details prior to mailing. 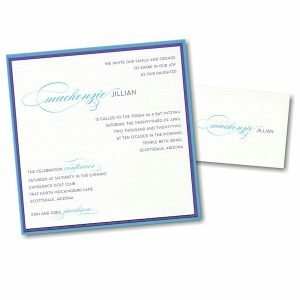 Please allow up to 2 weeks for production time for this fine, high-quality invitation.